After two recommendations from locals, we headed to Tao Heung on Carnarvon Road for yet another dim sum breakfast. This time the dim sum was much better than what we had the day before and much cheaper. The bill came as $118. 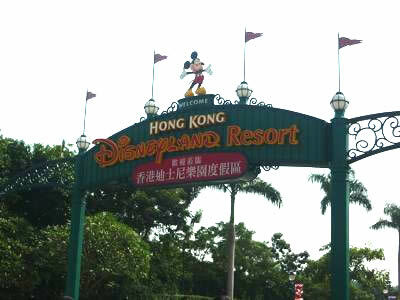 It was about noon when we were done with the breakfast and prepared to go to Hong Kong Disneyland by MTR. One small unexpected incident happened. My wife and J boarded a train but K and I were left behind before we got the chance to get on the train. I was not sure where to meet them again even though we had decided how to get to Disneyland and which station to change line. It didn’t cross my mind my wife would wait for me at Lai King station – the station which we were supposed to change train. The problem was I had my phone with a local number but my wife had none. While thinking hard how to reach my wife (I even approached the MTR staff to make a public announcement), my phone rang. It was my wife and she asked me to meet her at Lai King station. When it comes to situations like this, it is highly advisable to get your phone roamed or better yet, get a local SIM card to get connected. Later I found out from my wife that she borrowed a phone from a passenger at MTR station. Since it was a new Hong Kong number, she tried three numbers before successfully got my number right. We were relieved and we finally met at the said station before heading to Disneyland. This is the highlight of our trip… at least for the children. We reached Disneyland at about 12.30pm and it was the first day of our trip that it was a sunny day. Initially, we planned to come here two days earlier but due to unexpected weather conditions, we changed to this day after getting to know that it was a fine day based on the forecast. The queue was quite long at the ticket counter. Tickets are priced at $ 350 and $250 for each adult and child (ages 3-11) respectively. If you plan to go there for at least three times in a year, it is worthwhile to consider buying an annual pass. 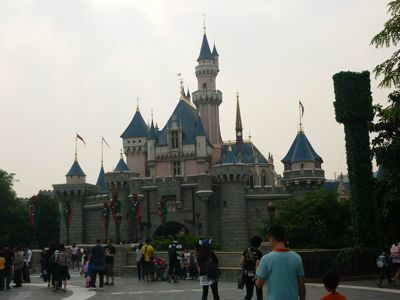 Hong Kong Disneyland is divided into four sections: Adventureland, Main Street, Fantasyland, and Tomorrowland. The theme park is not as big as it’s sister park in the US. But it is enough to keep the children busy for one whole day. Try not to miss the shows in Disneyland. They are all well planned and of high standard. J and K, for the first time, watched a 3D movie about Donald Duck here. We didn’t take as many rides as we wanted to because we ran out of time and needed to take small breaks on and off. Some rides do provide fastpass – which means you can get passes before hand and come back later for the rides by using fast queue. It can save you some waiting time. 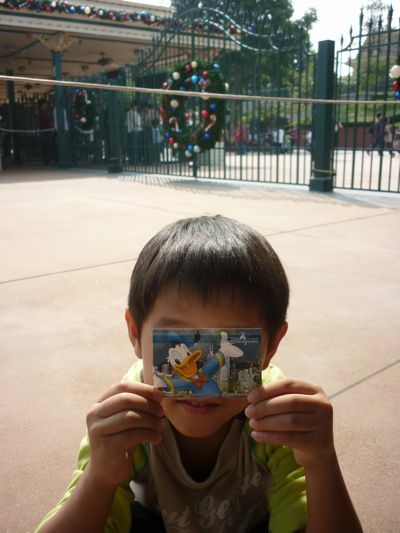 TIP: To motivate your children and keep them going around the park without making a fuss, get them to ask for stickers from any Disneyland staff you meet on the street. We came to know this by accident. All the Disneyland staff (especially cleaners in white uniform) has a small pockets to keep little magic stickers to distribute to young patrons of the park. Before Disneyland closes every evening, it has a firework display. On this day, everyone gathered in front of the castle at 7pm waiting for the fireworks. My wife was quite disappointed with the display as it was not as magnificent as what she expected. Maybe due to the fact that she had seen better displays before. After a tiring day at the park, we took a train back to where we stayed and had dinner at Tsui Wah Restaurant again. Later we went to Hui Lau San for mango dessert.